Is Win 10 a Winner? In the spirit of summer fun and thrills, we recently enjoyed a roller-coaster ride over the Washington Palouse hills on an 8230 combine "tricked up" for 45º slopes. Thanks again to the McCaw family, Paul Neiffer's generous neighbors who hosted the Farm Financial Standards Council (FFSC). 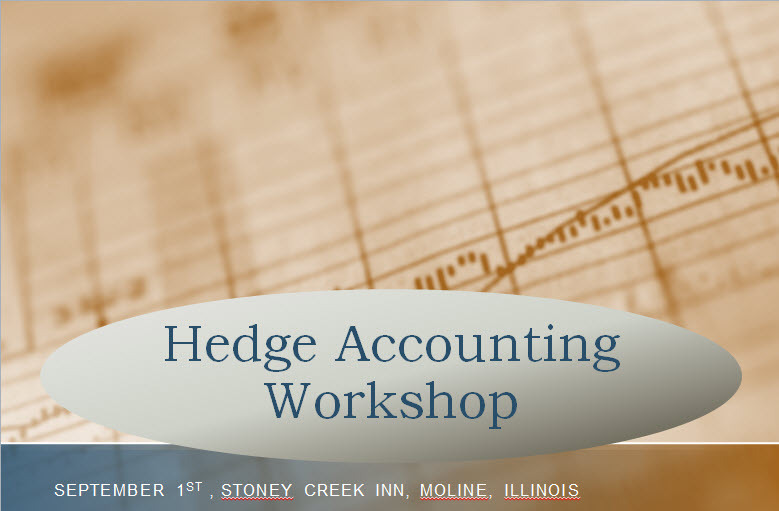 Paul will be traveling from the Washington Tri Cities to the Iowa-Illinois Quad Cities for the FBS User Conference, September 1-3, where he'll be leading the pre-conference Hedge Accounting Workshop (see below) as well as sharing the latest updates from the FFSC. Click here to register and/or download the User Conference brochure. Is Win 10 a winner or just the end of the road? Free download of the FFSC's Management Accounting Guidelines. Here's an updated FBS User Conference agenda with expanded details on the topics that will be covered on September 2nd and 3rd in Moline, Illinois. You can still register online or call 800-437-7638 / Extension 2 (no service fees for direct phone orders). Don't forget to make your hotel reservations at the Stoney Creek Inn (800.659.2220) and mention the FBS room block. Please note update schedule and topics are highlighted. Agricultural producers who use commodity futures and options will have a unique opportunity to learn the best accounting practices at an intensive workshop held on Tuesday, September 1, 2015, one day prior to the FBS User Conference at the Stoney Creek Inn in Moline, Illinois. Led by Farm Journal Top Producer's "FarmCPA," Paul Neiffer, CliftonLarsonAllen LLP, the session covers the fundamentals of accounting for hedges as documented in the 2014 edition of the Financial Guidelines for Agriculture published by the Farm Financial Standards Council (FFSC). Neiffer also servers as the current president of the FFSC. 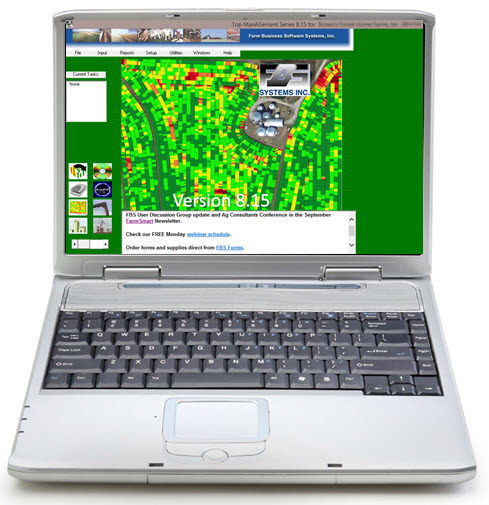 Participants will have the opportunity to work though realistic crop and livestock case studies developed by the FFSC Technical Committee using FBS software. Anyone within a farming operation who "touches" commodities--ag accountants, marketing specialists, controllers, CFOs and senior management--will benefit from this hands-on training. Registration is $195 for the first person, $95 for additional company representative. Each student will receive a copy of the Financial Guidelines for Agriculture, a workbook,and FBS data files..
Pork producers Mike and Amy Cronin of Bluevale, Ontario were chosen as the 2015 Outstanding Young Farmers (OYF) for Ontario at a recent OYF event in Ottawa. Mike and Amy have always been passionate about agriculture. They both grew up on family farms in Ontario, and knew their future would be on the farm. 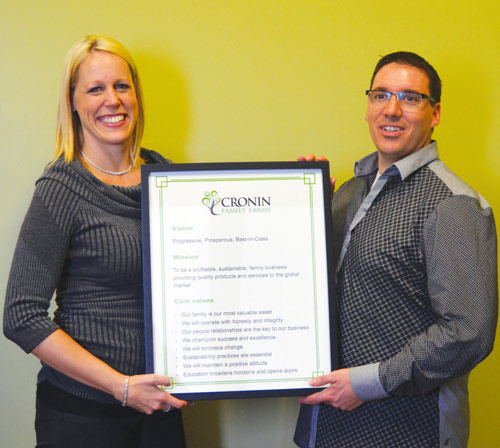 As a young married couple, they saw opportunity in the hog industry, starting Cronin Family Farms, and have never looked back. The couple will travel to Edmonton, Alberta, later this year where Canada’s outstanding Young Farmers for 2015 will be chosen. Bryant Agricultural Enterprises, Washington Court House, Ohio, was recently featured in the Wall Street Journal article, "To Feed Billions, Farms are About Data as Much as Dirt." We grieve for and celebrate two members of the "Greatest Generation" who left a lasting impact on American agriculture as well as a treasured family legacy. You'll find their stories remarkable and inspiring. Paulina Salopek, Las Cruces, New Mexico. Cortana, Windows 10's answer to Apple's Siri. Beginning last month many of you have begun receiving your free upgrade to Windows 10. The rest of you are asking, "should I upgrade now, and is my current copy of FBS software compatible?" The answer to the second question is "Yes." Both versions 8.15 and 10.4 work fine in the Win 10 environment. Reviews of Microsoft's "final solution" have been mostly positive; however, we're batting .500 here at FBS. With the first computer we "opted-in" to receive the upgrade and experienced no compatibility problems. In the case of the second computer, Windows 10 downloaded and installed itself without asking, and the wireless card wouldn't function. Fortunately, Win 10 allows your to uninstall and revert back to your previous version (Win 7 or 8.1) within 30 days after installing. You can also respond through FBS's Listserve. Q. I put my crop prepaid inputs into an asset account last year when I purchased them. The inputs have all now been applied through Crop Audit. How do I move the actual dollars from the asset account to an expense? A. It depends on how you recorded the original purchase. Scenario #1: Did you use an unlinked asset account to book the prepay dollar amount and then recorded the actual input purchases through Crop Audit to show the inventory as you purchased it? Then enter an accrual-level journal entry transferring just the (credit) dollar amount from the unlinked asset account to an unlinked expense account for crop inputs as a debit. Scenario #2: Did you use an unlinked asset account to book the prepay dollar amount (like Scenario #2) but have already recorded the applications through Crop Audit but have never entered the actual purchases of inputs? Then enter an accrual-level journal entry crediting the dollar amount from the unlinked asset account and debiting the linked expense account as you select the inputs from the pick list and enter the quantities. Scenario #3: Did you use a linked asset account to put in the original outlay for the prepay so that the inputs went into the Crop Audit inventory when you made the prepaid purchase? Then enter an accrual-level journal entry, crediting the linked asset account, entering a negative dollar amount and quantity for each input. The offsetting side of the journal entry is a debit to a linked crops input expense account with positive dollars and quantity for each input. My assumption for using an accrual-level entry journal entry is that you have already expensed the prepaid inputs for taxes and have used an accrual-level asset account and contra-expense account to adjust your accrual financial statements. What’s the best practice? We don’t recommend Scenario #1 since a) it requires a duplicate purchase in Crop Audit and b) there’s no clean tie-out between production records and accounting. The problem with Scenario #2 is that you’ve got to remember to expense the inputs at the cash-level in the prior year, then manually reverse (credit) the expense at the accrual level and debit the asset account. We also don’t like linked asset accounts (Scenario #3) since you have to “back out” the products at the original cost to move them to expenses. You can totally automate the inventory/cash/accrual process by implementing E.CLIPSE Management Accounting. You just expense the prepaids into linked expense accounts for tax purposes and the system automatically moves those costs to a raw material inventory on the balance sheet, then adjusts the balance sheet and physical inventories properly as applications are recorded. 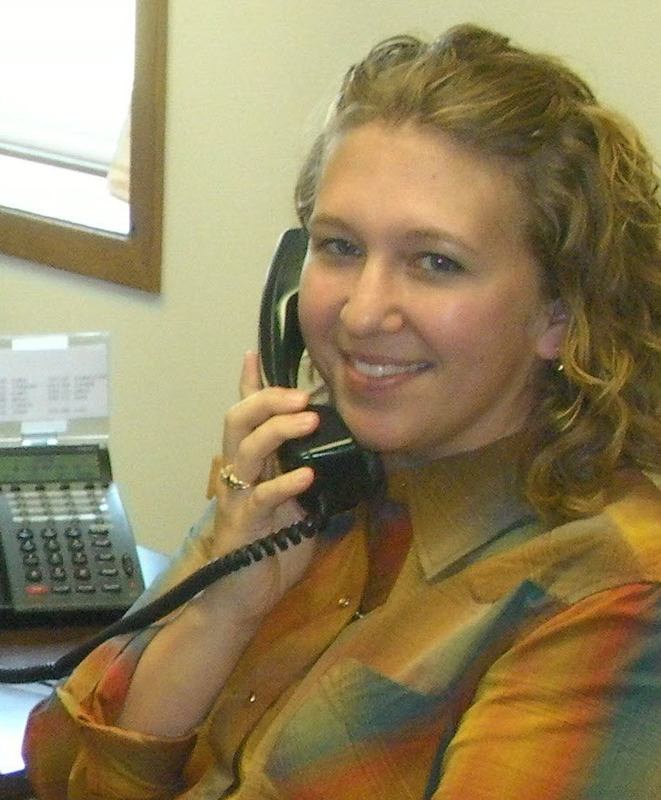 Editor's note: Sarah will be teaching sessions on financial statement basics, productivity tools, crop reports and one-on-one training at the User Conference.